Crossrail bosses have set out the chain of events that led to the admission that the main section of the cross-London rail link will open up to a year late. Appearing a special meeting of the London Assembly Crossrail Ltd, CEO Simon Wright said the delay had been caused by a ‘complicated’ combination of factors, including unfinished construction work and problems with testing. He said it had always been known that the integration of the three separate signalling systems on Crossrail would be complicated but that testing had gone slower than had been expected, meaning that the process of getting clearance from regulator the Office of Rail and Road had been delayed. Mr Wright added that an electrical explosion in October last year at Pudding Mill Lane had delayed tunnel trials until February. ‘We started testing later than we would have liked and those tests have not gone as well as we would have hoped,' he said. Asked how much more time would be needed, Mr White said that full-scale round the clock testing would begin next month, after which it would be possible to predict when future phases of testing would begin, ‘and we’ve said autumn 2019’. 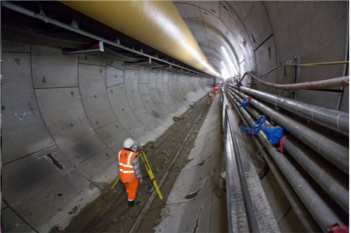 Sir Terry Morgan, chairman of Crossrail Ltd, said that as late as July the firm was continuing to work towards the December 2018 opening date for the core section of the line through central London. The decision to announce a delay was taken at a board meeting on 29 August and the announcement made public two days later. Asked when he first heard of the delay, London mayor Sadiq Khan said that his officials were told on the day of the meeting and that it was formally communicated to him, Transport for London and the Department for Transport the next day.